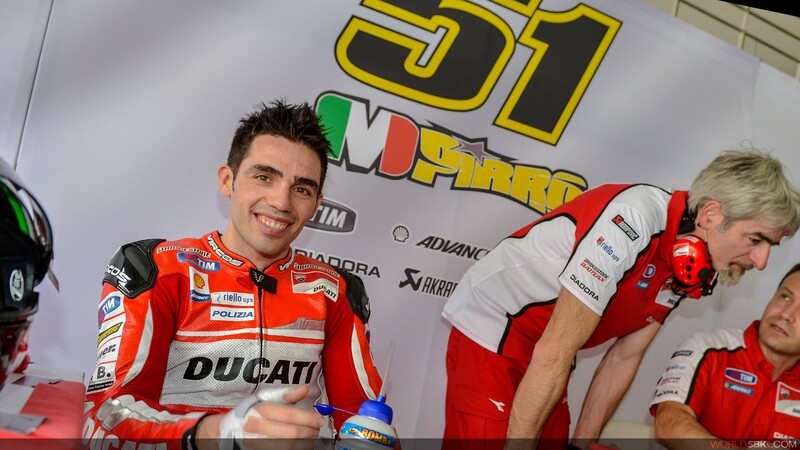 The Aruba.it Racing - Ducati Superbike Team announces that Michele Pirro will ride the Italian team’s third Ducati Panigale R this weekend in place of injured rider Luca Scassa. Scassa, who was participating in this eighth round of the Superbike World Championship as a wildcard entry, was unfortunately the victim of a serious crash in today’s second timed practice at the Misano World Circuit. Unfortunately the accident has left him with a fractured right collarbone which prevents him from continuing this weekend, and so the Aruba.it Racing - Ducati Superbike Team has asked Michele Pirro, Ducati MotoGP test rider and current leader of the Italian CIV Superbike championship, riding the Panigale R with Team Barni Racing, to ride Scassa’s bike for tomorrow’s sessions and Sunday’s races.